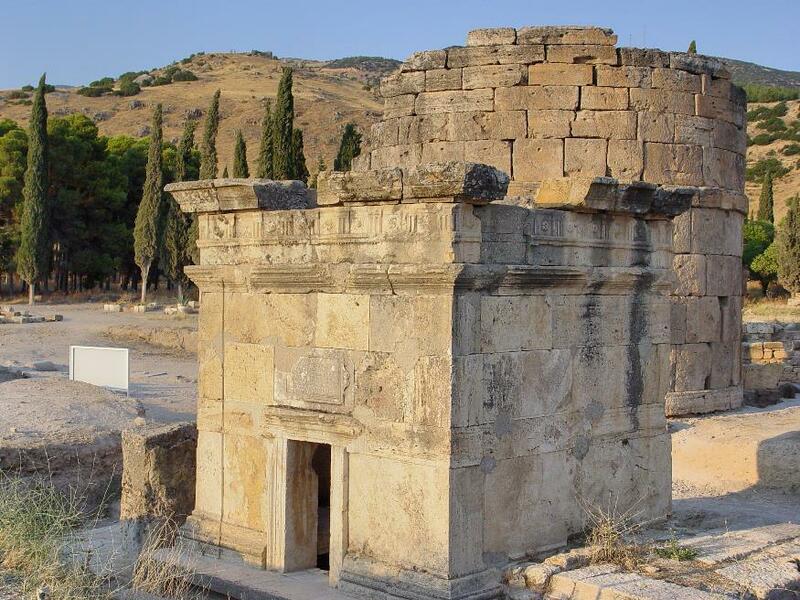 The necropolis of Hierapolis is one of the largest ancient burial sites in Turkey. Tombs there date from 2nd century BC through 3rd century AD. One of the more interesting is that of T. Flavius Zeuxis and his sons (1st century AD). 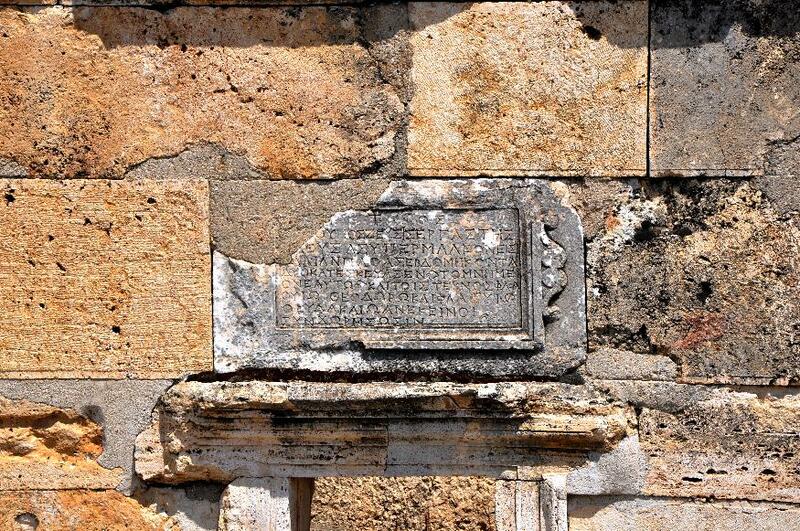 Tomb of Flavius Zeuxis, merchant of Hierapolis. Photo ©Leon Mauldin. Dr. Carl Rasmussen observes: “Note the finely carved doorway with doorposts and lintel, the carved base, the slightly protruding stones of the corners (pilasters) of the tomb, the upper molding, and the Doric frieze composed of triglyphs and metopes filled with rosettes!” Click here. Tomb Inscription above door. Photo ©Leon Mauldin. It was a dangerous cape, and to round Cape Malea had in ancient days much the same sound and implications as to round Cape Horn had in later times. The Greeks had two sayings which showed what they thought of the voyage round Malea-“Let him who sails round Malea forget his home,” and, “Let him who sails round Malea first make his will.” (The Letters to the Corinthians, p.1). Obviously it would have been considered quite an accomplishment to have made 72 trips around the Cape. This would mean a total of 36 round trips this merchant had made from Hierapolis of Asia Minor to Italy and back! Some have suggested that Zeuxis would have made two or three trips per year from Hierapolis to sell his goods in Italy. Epaphras, who is one of you, a bondservant of Christ, greets you, always laboring fervently for you in prayers, that you may stand perfect and complete in all the will of God. For I bear him witness that he has a great zeal for you, and those who are in Laodicea, and those in Hierapolis. (Col. 2:12-13, NKJV). The Zeuxis inscription shows it would not be unusual for residents of the Lycus River Valley, such as Epaphras, to make the voyage to Rome and back. I have been on journeys many times, in dangers from rivers, in dangers from robbers, in dangers from my own countrymen, in dangers from Gentiles, in dangers in the city, in dangers in the wilderness, in dangers at sea, in dangers from false brothers (2 Cor. 11:26, NET). But notwithstanding the potential dangers faced, travel by sea in the 1st century was common! And the merchants of the earth will weep and mourn over her, for no one buys their merchandise anymore: merchandise of gold and silver, precious stones and pearls, fine linen and purple, silk and scarlet, every kind of citron wood, every kind of object of ivory, every kind of object of most precious wood, bronze, iron, and marble; and cinnamon and incense, fragrant oil and frankincense, wine and oil, fine flour and wheat, cattle and sheep, horses and chariots, and bodies and souls of men. This entry was posted on Thursday, June 26th, 2014 at 12:27 PM and is filed under Archaeology, Bible History and Geography, Bible Study, Biblical Interpretation, New Testament, photography, Roman Empire, Travel, Turkey. You can follow any responses to this entry through the RSS 2.0 feed. You can leave a response, or trackback from your own site.